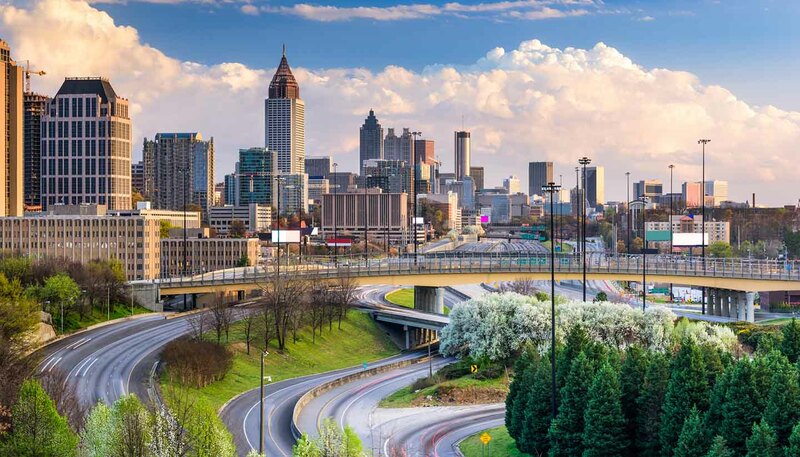 The major airport is: Atlanta Hartsfield-Jackson International Airport. Hartsfield-Jackson Atlanta International Airport is situated 16km (10 miles) south of Atlanta. From London to Atlanta is 9 hours, and from New York is 2 hours 10 minutes. The Amtrak (tel: 1 800 872 7245, in the USA only; www.amtrak.com) 'Crescent' service, linking New York City with New Orleans, stops in Atlanta, while the 'Silver Service/Palmetto' service between New York City and Miami stops in Savannah. Bus 23 runs to the Amtrak station in Atlanta, 1688 Peachtree Street; a taxi is required to get to the Amtrak station in Savannah, which is situated some 5km (3 miles) southwest of the city, at 2611 Seaboard Coastline Drive. From Atlanta to Chattanooga is around 2 hours and 15 minutes, to Mobile is 6 to 8 hours, to St Petersburg is 12 to 14 hours. Main portsBatumi and Poti. Batumi and Poti provide international connections with sea ports in Bulgaria, Ukraine and Russia.